Connection to the Heart in meditation wisely directs the energetic interactions between the mind, emotions and body within a human being. 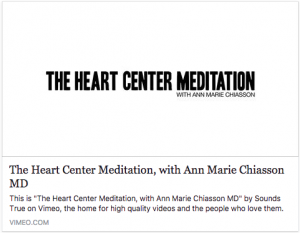 The Heart Center Meditation is an act of meditation with an emphasis on opening and healing the heart. This meditation brings energy into the body and directs it toward the heart which can provide long-lasting benefits. Feel Compassion, Innate Harmony, Healing Presence and Unconditional Love, by practicing Heart Centered Meditation everyday . What is Spirituality and what is it’s role in health care?